Aim: The purpose of this prospective cohort study was to investigate, over an 18-month period, soft and hard tissue response to a transmucosal implant with a convergent collar inserted in the anterior maxillary esthetic area. Materials and methods: From June 2013 to January 2014, 14 consecutive patients were enrolled (7 men and 7 women; mean age 63.7 ± 14 years) with 20 implants, needing at least one implant-supported restoration between the canines in the maxillary anterior esthetic area. Six months after hopeless tooth extraction and an alveolar socket graft, a transmucosal-type implant with convergent collar walls was inserted in a midcrestal position with mini-flap surgery. An impression was taken 2 months later, and a definitive abutment with a provisional restoration was positioned. The final restoration was seated 2 weeks later. Clinical parameters, photographs, radiographs, and impressions were taken at this timepoint, and after 6 and 18 months. Using dedicated software, radiographic analysis (to detect marginal bone-level changes) and cast analysis (to detect soft tissue vertical and horizontal changes) were performed. Results: At the 18-month follow-up, all implants were clinically osseointegrated, stable, and showed no sign of infection. At baseline, interproximal radiographs revealed no bone defect around the implant. After an initial minimal bone loss (0.09 ± 0.144 mm), radiographic analysis showed a stable condition of bone remodeling (mean value 0.09 ± 0.08; range 0.0 to 0.5 mm) at the 18-month follow-up. No statistically significant horizontal dimensional changes of the alveolar ridge were observed between each timepoint. Mean soft tissue levels significantly improved between baseline and 18 months. The mean heights of the mesial papilla (MP) and distal papilla (DP) changes were 0.38 ± 0.22 and 0.47 ± 0.31, respectively. The level of the labial gingival margin (LGM) was 1.01 ± 0.63. Periodontal parameters never exceeded the physiological levels. Conclusions: Within the limitations of this preliminary study, the analyzed implants produced positive results in these esthetically demanding cases. This outcome should encourage long-term studies in order to assess, through controlled clinical trials, whether this convergent collar design offers advantages over other designs. Furthermore, due to the peculiar crestal module, together with the use of delayed implant insertion and a postextraction ridge preservation technique with biomimetic hydroxyapatite, the analyzed implants seem to help prevent the negative bone remodeling typically associated with two-piece implant systems, but without the well-known drawbacks of traditionally designed transmucosal implants. Therefore, wherever crestal bone preservation is a critical issue for clinical success in the anterior maxillary area can be considered of particular interest. Two common complications that occur following immediate implant placement and provisionalization procedures in the anterior maxilla are changes to the facial periimplant soft tissue levels and the facial contours. To counteract these changes, different techniques and treatments have been recommended. The recently introduced socket-shield technique (SST) appears to be a viable treatment option for stabilizing the facial osseous and gingival architecture; however, preparation of the root fragment can present challenges. This article describes a surgical approach designed to facilitate preparation of the facial root fragment. Objectives: Evaluate the fatigue resistance and failure mode of novel-design implant restorations made of histoanatomic computer-assisted design/computer-assisted manufacturing (CAD/CAM) bilaminar bonded assemblies. Material and methods: 60 screw-retained implant restorations were fabricated. Monolithic restorations were used as a control group (15 lithium disilicate: group CE; and 15 nanofilled composite resin: group CL), and compared with bilaminar restorations (15 dentin-shaped lithium disilicate mesostructures with a bonded nanofilled composite resin veneer: group CEL; and 15 dentin-shaped nanofilled composite resin mesostructures with a bonded lithium disilicate veneer: group CLE). All monolithic and bilaminar restorations were assembled and bonded to a customized metal implant abutment. Cyclic isometric chewing (5 Hz) at a 30-degree angle was simulated, starting with 5,000 cycles at a load of 150 N, followed by 20,000 cycles with increments of 50 N. Samples were loaded until fracture or to a maximum of 160,000 cycles. The groups were compared using the Life Table survival analysis (logrank test at P = 0.05; post hoc tests at P = 0.008). Results: In the CL group, restorations failed at an average load of 347.39 N (98.361 cycles), and in the CLE group at an average load of 313.20 N (83.105 cycles), and none of the specimens withstood all 160,000 load cycles. In the CE group, restorations failed at an average load of 381.47 N (119.115 cycles), and in the CEL group at an average load of 415.20 N (132.873 cycles), with survival rates of 26% and 33%, respectively. Post hoc tests from the load step data showed higher fatigue resistance of CEL compared with CLE (P = 0.003). Conclusion: Lithium disilicate monolithic restorations and mesostructures with nanofilled composite resin veneer presented higher survival rates when compared with nanofilled composite resin restorations. The process of tooth eruption consists of two phases, active and passive. While the distinction is unequivocal, the mechanism is ambiguous. This article compares and contrasts altered passive eruption (APE) and active secondary eruption (ASE). Although these phases present with similar clinical manifestations, each has its own etiology, physiogenesis, and pathogenesis. Furthermore, the differential diagnosis between the two, and that between other mirroring conditions, is essential for arriving at a definite diagnosis and correct treatment strategies, which may be similar but have different consequences. This article concludes with two case studies that show the management of APE and ASE, highlighting the treatment similarities and differences that are dependent on the specific etiology. Purpose: An esthetically pleasing smile is one of our patients' main goals. However, it is not always clear that the esthetic perceptions of patients and clinicians are the same. 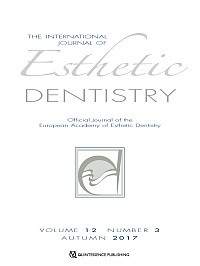 The purpose of this study was to evaluate and quantify the discrepancies in the esthetic perception of maxillary incisor torque among professionals, and between professionals and the general public. Materials and methods: A photograph of a 30-year-old woman was digitally manipulated to obtain nine smile images and nine full-profile images with various maxillary incisor torques, while maintaining the overjet. The images were evaluated in an online survey by three different groups: laypersons (LP, n = 21), orthodontists (OR, n = 20), and specialists in dental esthetics (SDE, n = 19). Results: From among the smile images, the LP group preferred the 80-degree option (the angle that forms the tangent between the crown of the maxillary incisor and the functional occlusal plane), the SDE group preferred the 75-degree option, and the OR group preferred the 70-degree option. From among the full-profile images, both the LP and the SDE groups preferred the 80-degree option, while the OR group preferred the 75-degree option. To analyze the data and verify or reject the hypotheses of normality and homoscedasticity, ANOVA and Kruskal-Wallis tests were used. Conclusions: The LP and SDE groups coincided, in contrast to the OR group, which preferred more protrusive torques and was less tolerant of retroclined maxillary incisors. Objective: The objective of this study was to compare the performance of visual shade matching and spectrophotometric measurements. Materials and methods: A total of 100 observers matched pairs of corresponding shade tabs from two VITA classical A1-D4 shade guides. The tab identifiers on one shade guide were masked. Lack of visible color differences between the corresponding tabs was confirmed by means of an intraoral spectrophotometer. Means and standard deviations were calculated. Analysis of variance (ANOVA) (? = 0.05) with a Bonferroni correction was performed to detect significance of differences between groups. Results: A total of 72.5% of tab pairs (or 11.6 tabs) were matched using the visual method, and 98.9% were matched using the spectrophotometer (P < 0.001). Female observers showed significantly better results than male observers (P = 0.027). Both genders showed the highest visual scores in group B, followed by groups C, A, and D.
Conclusions: Instrumental shade-matching systems have the potential to improve color matching in dentistry. Results were influenced by gender. Clinical relevance: The dental spectrophotometer exhibited a significantly higher percentage of correct matches of corresponding shade tabs compared with conventional visual shade matching.